Weng, B., Ashraf, S., Innis, P. C. & Wallace, G. G. (2013). 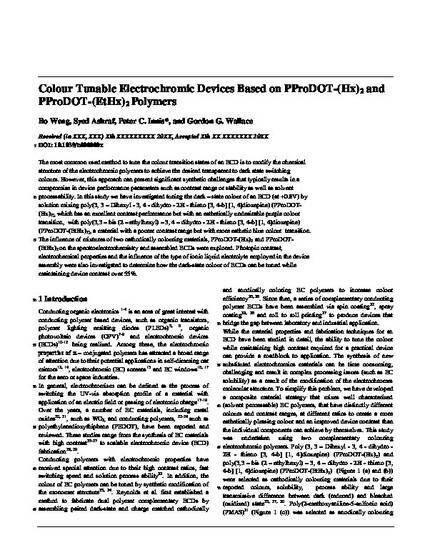 Colour tunable electrochromic devices based on PProDOT-(Hx)2 and PProDOT-(EtHx)2 polymers. Journal of Materials Chemistry C, 1 (44), 7430-7439. The most commonly used method to tune the colour transition states of an ECD is to modify the chemical structure of the electrochromic polymers to achieve the desired transparent to dark state switching colours. However, this approach can present significant synthetic challenges that typically result in a compromise in device performance parameters such as contrast range or stability as well as solvent processability. In this study we have investigated tuning the dark-state colour of an ECD (at +0.8 V) by solution mixing poly(3,3-dihexyl-3,4-dihydro-2H-thieno[3,4-b][1,4]dioxepine) (PProDOT-(Hx)2), which has an excellent contrast performance but with an esthetically undesirable purple colour transition, with poly(3,3-bis(2-ethylhexyl)-3,4-dihydro-2H-thieno [3,4-b][1,4]dioxepine) (PProDOT-(EtHx)2), a material with a poorer contrast range but with more esthetic blue colour transition. The influence of mixtures of two cathodically colouring materials, PProDOT-(Hx)2 and PProDOT-(EtHx)2, on the spectroelectrochemistry and assembled ECDs was explored. Photopic contrast, electrochemical properties and the influence of the type of ionic liquid electrolyte employed in the device assembly were also investigated to determine how the dark-state colour of ECDs can be tuned while maintaining device contrast over 55%.